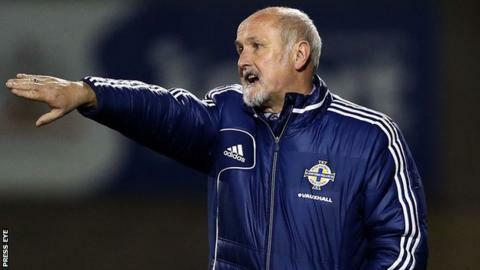 Northern Ireland women's manager Alfie Wylie has named an experienced squad for the World Cup qualifiers which take place over the next eight days. The Irish, with only one point from their opening three games, face Sweden at Shamrock Park on Saturday at 19:30 BST before taking on the Faroe Islands away on 10 April. Wylie's 20-woman squad contains no uncapped players. They have yet to score a goal in their qualifying campaign. The Irish opened their campaign with a 2-0 away defeat by Scotland and a 0-0 draw against Bosnia was then followed by a disappointing 3-0 home reverse against Poland. After their opening three games in Group 4, Wylie's team's chances of earning qualification already look remote. They will face a tough test on Saturday against a Swedish team that have won their three opening qualifiers. The Swedes, currently fifth in the Fifa world rankings, are second in the Group 4 table behind Scotland who have won their opening four qualifiers. The 70th-ranked Faroe Islands are propping up the table after losing their opening three games. Midfielders: Nadene Caldwell [Glentoran Belfast United], Danielle McDowell [Crusaders Strikers], Simone Magill [Everton Ladies], Marissa Callaghan [Cliftonville Ladies], Sarah Venney [Linfield Ladies], Laura Rafferty [Chelsea Ladies], Lynda Shepherd [Manchester City].